Here's one for those of you planning your garden for Spring! As someone with a small yard, I love the idea of using vertical space for expanding my gardening possibilities. 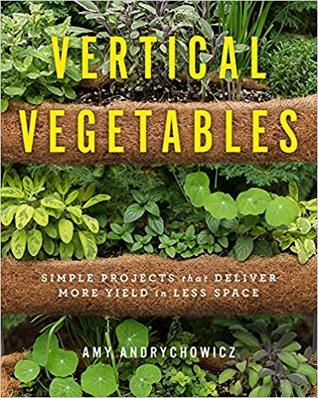 The author goes over the basics of vertical gardening, how to choose what to grow and care of the plants and finally, the various ways to grow vertically - from trellises and other structures to train plants upward to creating living walls and hanging gardens to various planters and towers (including instructions for building your own of a variety of styles). There's an option to fit basically any growing space you have available. What I love here is that the various options aren't just practical space-savers, but are visually appealing so they add to the landscape in addition to being functional. Aside from having a small space in which to garden, many of the vertical options will also help in my fight against pests. I'm already planning next year's garden! Thank you to the author Amy Andrychowicz, Quarto Publishing Group - Cool Springs Press and NetGalley for the opportunity to read and review this informative book. All comments are my own, unbiased opinion.